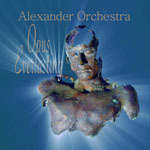 I’m very proud to appear on the debut CD by Alexander Orchestra, Opus Everlasting. Violinist Alex Sneicki has created some memorably melodic and richly-textured music. The style could be described as Classical Crossover / World-Music. My piano playing is featured in 7 tracks. I very much enjoyed the magical synergy of our work together. Among my favorite tracks are: “One Last Look” and “Ocean Song”.Please… take a LISTEN & SUPPORT independent music.